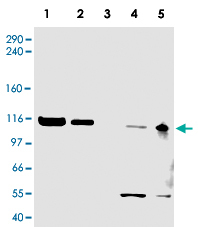 Western blot using ATAD5 polyclonal antibody ( Cat # PAB10222 ) shows detection of a band ~120 kDa corresponding to human ATAD5 ( arrowhead ) in various cell lysates.Lanes contain ~ 5 µg of HeLa nuclear extract ( 1 ), HeLa ( 2 ), A-431( 3 ), Jurkat ( 4 ) and HEK293 ( 5 ) whole cell lysates.After SDS-PAGE, transfer and blocking, the membrane was probed with the primary antibody diluted to 1:500.The membrane was then washed and reacted with a HRP conjugated Gt-a-Rabbit IgG [H&L] MX followed by ECL detection using a 2m exposure time.The expected molecular weight of ATAD5 is 120 kDa according to Kanellis P et al. 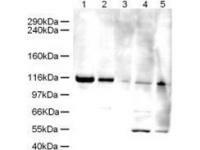 2003, although the predicted molecular weight is 207 kDa.The 50 kDa bands in Jurkat and 293 cell lysates are probably cross-reaction with other proteins.Both the 120 kDa and 50 kDa bands are not observed when antibody is pre-incubated with peptide ( datanot shown ). WB using Anti-Elg1 antibody shows detection of a band ~120 kDa corresponding to human Elg1 (arrowhead) in various cell lysates. Lanes contain ~5 ug of HeLa nuclear extract (1), HeLa (2), A431 (3), Jurkat (4) and HEK293 (5) whole cell lysates. Primary antibody was used at 1:500. The expected molecular weight of Elg1 is 120kDa according to Kanellis P et al. 2003. The 50kD bands in Jurkat and 293 cell lysates are probably cross-reaction with other proteins.